If you’re going to be at the hacker mecca of the DEFCON security conference in Las Vegas this weekend, there is a lot to keep the maker interested, both security related and beyond. While DEFCON last year moved away from electronic badges, this year the DEFCON electronic badges have returned (pictured above). And the sought after Ninja Network “badge” is also back with a vengence—now it’s a GSM phone and associated dedicated phone network. 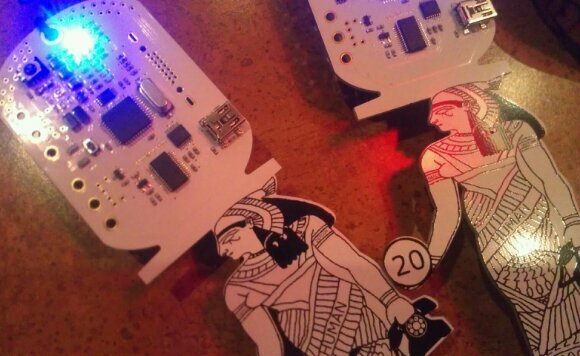 Look for the many people who will spend their weekend hacking on one of these electronics badges. Make sure you also get along to the Hardware Hacking Village which makes a welcome return this year. Looks like you’ll find talks and maybe even a learn to solder session. A great opportunity to meet Makers and others with an interest in hardware. If this year is anything like previous years, you might even be able to find vintage computer hardware (like the PDP-11) hiding away in a room. But beware of charging stations bearing juice.